After 7 years of incessantly channeling their aggrobeat sound, Blood Sport are calling it a day. 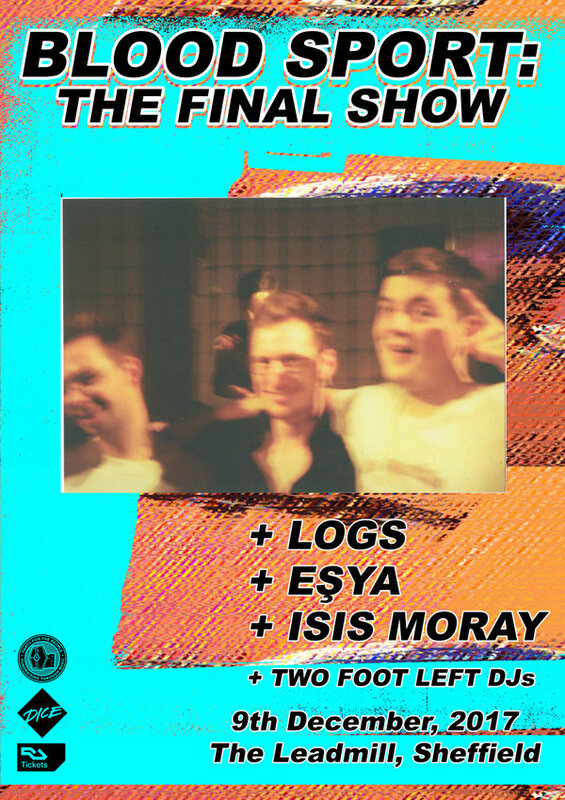 In this - their final ever performance - they will be gracing the stage of the legendary Leadmill in Sheffield to play a set of their trademark blistering sounds along with a collection of special guests and friends. Blood Sport formed in 2010 over a shared love of Fela Kuti and Talking Heads, hoping to fuse these styles utilising a murky glue of noisy abrasion. Early releases saw them connecting with local Sheffield DIY labels such as The Audacious Art Experiment and Tye Die Tapes who offered a platform for their exploratory ideas. The heady draw of electronic club sounds quickly infected their music, as they increasingly became configured for the club space. The incorporation of a drum machine drove their rhythmic intensity to new heights, with a constant push-pull between human drummer and machine becoming a hallmark of their emergent style. Matching lacerated guitar shards with polyrhythmic complexity, they have since released on Blast First Petite, Howling Owl and Helena Hauff’s Return To Disorder label, as well as touring internationally from Roskilde festival to the legendary sweatbox of Hamburg’s Golden Pudel club. Integral to their mission has been integrating their music with those of other performers whose mission is to explore the territory between live experimentalism and club-ready dance euphoria. Central to this was their Hybrid Vigour events which saw the realisation of this stylistic composite in venues throughout Sheffield, with acts such as Mica Levi, Nisennenmondai, Inga Copeland and Islam Chipsy all contributing to nights filled with intoxicating abandon and diverse freneticism. Made up of members from Drenge, Wet Nuns, Saif Mode and Seize the Chair, Logs was formed without much thought last year over a mutual love for fuzzy jams and spacey synth tones. Their songs glide between whimsical ballads to high-speed calamity, delivered with a dogged energy. Logs Logs Logs!! Eşya, is a sonic exploration of another version of oneself. The duality of conflicting traits, ideas and views that can exist within one being and how one deals with such conflict – The Absurdity of being.